Now, it's my turn to give a long-winded speech that could have been an e-mail. I want to start by saying, from all of us, thank you. Thank you to the Peace Corps staff for putting up with 100 naive, ideological Americans with so much time on their hands, and so desperate for meaning that they travelled halfway across the globe with the simple goals of changing the world and getting some good Instagram photos. Thank you to our LCFs, to the people back home, and to our host families. Thank you to the communities who have welcomed us, and those about to welcome us. For many of us, this was a dream years in the making, and it’s hard to overstate the role that each one of you played in getting us here. We are Staj 100. We arrived in Morocco on September 11, 2018, and have now completed CBT after having many fantastic experiences and going on many great adventures. Or, at least, that's how it is on paper. The truth, though, is that I can't speak to our collective experiences in CBT. Each group, and each individual found experiences and formed relationships so special that it would be an insult to even try. 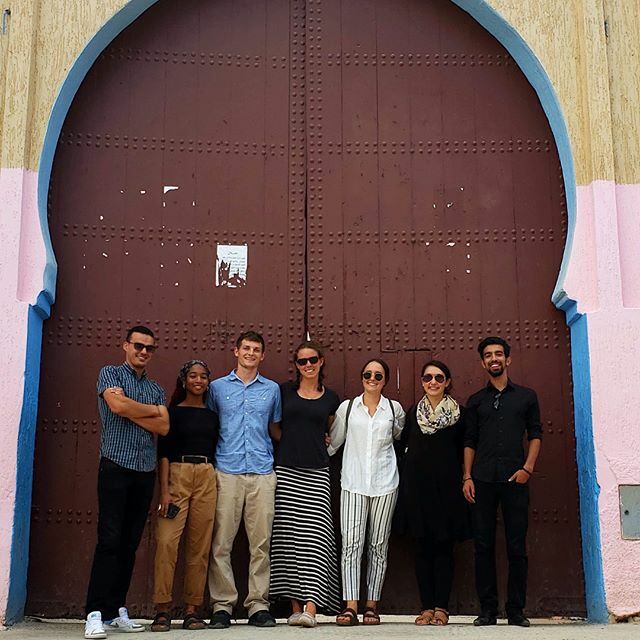 The things that we experienced weren’t unique (after all, this is the 55th year that Peace Corps has been in Morocco), but our CBT experiences weren't special because they were unique. They were special because they were ours… and unless we are like Ty or Kylie, it is the only time we will ever get this experience. Our CBTs have been, for two months, our homes, our families, our friends, and our centers of work, play, attention, and love. So, because I can't speak to all of our experiences, and because I am a naive, ideological American with so much time on my hands, and so desperate for meaning that I travelled halfway across the globe with the simple goals of changing the world and getting some good Instagram photos, I will just speak to that last part - love. Love, sits near the core of each of our individual reasons for being here. It is something that we each express in our own way. Some of us absolutely glow with it, and are unafraid to dangle it out in the open. For others, it is something that we hide deep within ourselves, only showing it to those we are truly comfortable with. In whatever way you may express it, don't forget that it is there, and don't forget to let it guide you, no matter what you do. Love those who are close to you, those who will support you no matter what. Love your friends, your host families, and your fellow PCVs. Love the person who will never be more than just a face you wave to across the street, or one that greets you from behind a counter. Love the ones who are easy to love, and the ones who desperately need it. Love people, even if that means blocking them with a piece of wood so that they won't go out on a wet tin roof to fetch a pair of shoes. Love the people who won't love you back, the ones who cause you trouble. Love, even when that love is only expressed through the phrases, "no, you can't," and, "because I said so!" Love the ones who don't want you to love them, and the ones who will hate you for it. Love the ones who throw rocks at you, who spit on you, who touch you and call you names. Love them, even when you know the awful things that they've done. Love the ones who don't deserve your love, because sometimes we won't deserve theirs. Love, even when it is boring and difficult, when you are tired and you want to quit. Love strongly and sensibly, and remember that, though our experiences are our own, we are, Moroccan and American, all in this together. Call your mom, brush your teeth, wash your clothes after three wears... but most importantly, over the next two years, remember, more than anything, to love. Youssef, for my first five or six months of service, was simply one of the young men who hung out at the youth center, or dar chebab, regularly. At that time, I was still learning who was who and what their roles were as I slowly but surely integrated. When it came time to invite a counterpart to accompany me to the Project Design & Management workshop hosted by Peace Corps, the local youth I talked to advised that I take Youssef, currently the president of the Hope Association for Culture & Sports. "He’s reliable, available, and savvy," they said. A year and a half later, I feel so fortunate to have been pointed in his direction. Our primary project together was Creating Leaders in the Mountains & Beyond (CLIMB), a dynamic outdoor leadership program that benefited at least 40 Moroccan youth from two Peace Corps sites and has been a major part of our work for the past 10 months. Aside from CLIMB, Youssef has reliably helped me in nearly every aspect of my service and life here in Morocco. From bargaining for my life-changing washing machine and welcoming my mom and aunt during their week-long trip to Morocco to helping me cope with security incidents, literally pulling me up Mount Toubkal, and being there for everyday dar chebab life, he has been an ideal counterpart and a wonderful friend--not only to me, but to other PCVs and PCTs as well. As my service comes to a close all too soon, I’m feeling extremely grateful to him and to countless others who have made my time in this place--my second home--impactful, happy, and unforgettable. They thought their work wouldn’t sell, that people would doubt their abilities and demean their success in creating a women’s cooperative—and yet in October 2018, the women of Cooperative Nahda in the Middle Atlas town of Oued Ifrane cheered and clapped when artisan leader Mustapha Chaouai announced their most recent sales success through the online platform of the collective Anou. A woman in the cooperative shows off a rug typical for her region in the Middle Atlas Mountains. Before the cooperative began, women in town individually wove rugs and crafted other items to sell at Oued Ifrane’s weekly market or in nearby towns. In 2012, with the encouragement of Mustapha, ten women formed an association to join efforts in creating and selling products. In their first two years, they attended trainings and traveled to sell their wares, though they rarely sold much, according to the women. Around that same time, a PCV in the Ait Bouguemez valley, Dan Driscoll, came up with the idea of creating an online platform as a way for cooperatives to sell their products directly to an international market, rather than through middlemen. 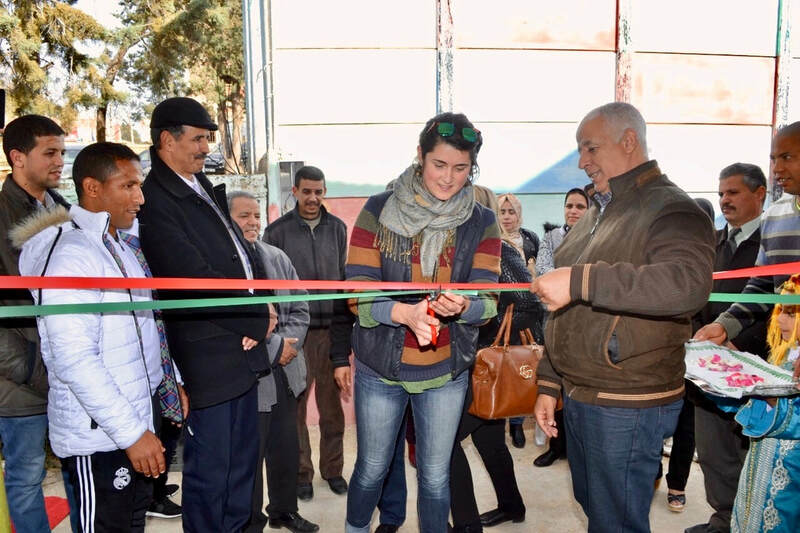 Prior to Peace Corps Morocco’s switch to Youth Development as a single sector in 2011, it had placed volunteers with cooperatives as part of its Small Business Development program, and many PCVs in the Youth Development sector have continued to work with cooperatives in their sites. The Anou has created a network of cooperatives; trained artisans about the supply, production, and marketing chain; and enabled them to sell products directly abroad through its website. By 2014, Mustapha and the PCV living in Oued Ifrane at the time had connected with Anou. The women’s association became a cooperative, and they joined Anou. 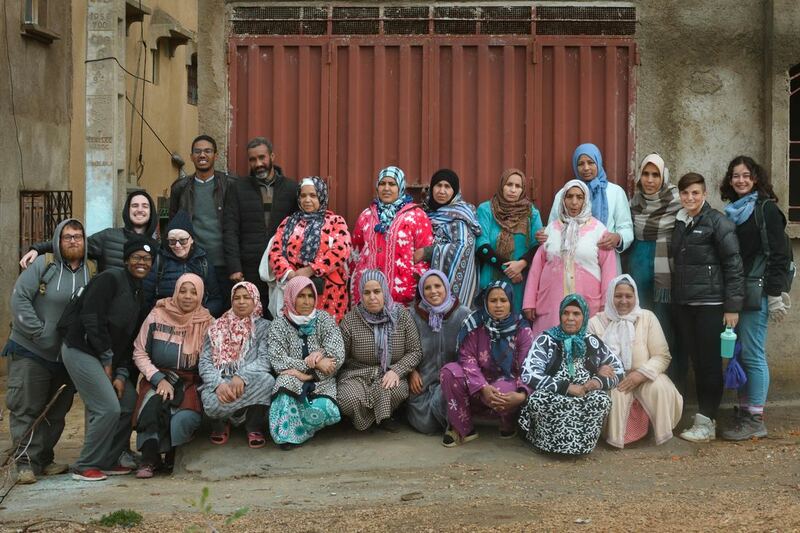 Since then, the cooperative has thrived: they have attended more trainings, built an expansive network of fellow cooperatives across Morocco, filled direct custom orders requested by buyers, sold more products, and earned more money to split among the women and reinvest into the community. Mustapha now works for Anou as an artisan leader and talent developer, traveling across Morocco to identify potential cooperative partners for Anou. Two types of rugs that the women make at the cooperative. Peace Corps Trainees (PCTs) of the 100th group of volunteers in Morocco sat in on our meeting with the twenty women of the cooperative and Mustapha to learn more about life in their training site. Said PCT Anna LaRocco Masi, "I have met the women of the co-op several times, and each visit, I grow more impressed and inspired by what they are doing. They do not give up even when they run into business-related obstacles. 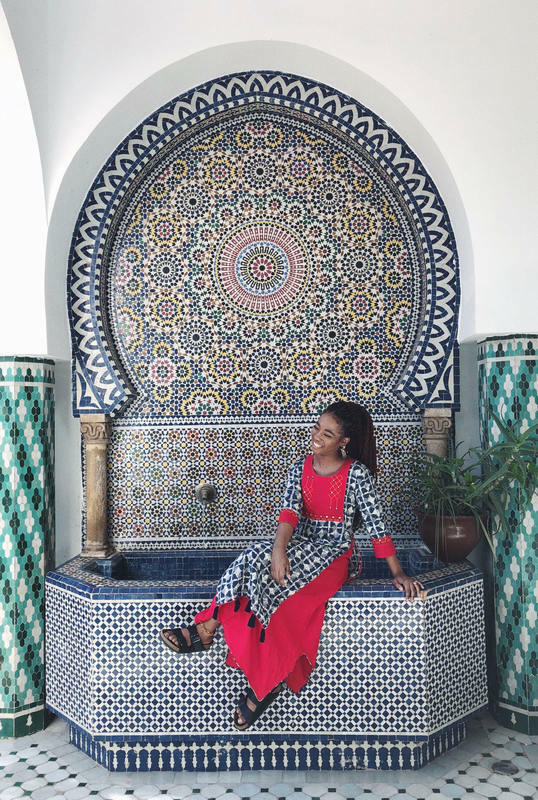 Meeting them is an amazing cultural experience because I got to see what local Moroccan women are doing on a daily basis to succeed for themselves and their families." Women of the cooperative, some of whom are host family members of current Peace Corps Trainees, sing and clap as some trainees broke out dance moves. The women have learned new designs from Anou and lessons from other cooperatives, while forming strong bonds amongst themselves—the women are proud of the fact that they get along well, have become friends, and have rarely experienced conflict. Moreover, one woman added, working outside the home and earning her own income has brought her independence. Now life is different than before, the women agreed. They have learned from their own accomplishments and success and have grown more confident in their abilities to sustain the cooperative together. The women of the cooperative, Mustapha, current PCTs and their teacher, and PCV Jan. Earlier this year, Returned Peace Corps Volunteers, Michael and Eha Scanlon, were contacted by one of their former students, Mohammed, after about 40 years apart. Mike and Eha had served in Guercif, Morocco, from 1977 to 1979, teaching high school English. Since Mike and Mohammed share the same birthday, they thought it was the perfect time to return and celebrate their lasting friendship with him. Ayoub is a university student, neighbor, counterpart, and friend to volunteers Jacob and Megan. When Ayoub was younger, his mother used to tell him stories of the Peace Corps volunteers from America she knew and worked with. The stories he listened to turned into a fascination with the English language and American culture. When Ayoub was in High School, one of his English teachers was a former LCF for Peace Corps, and a returned volunteer helped him tutor for his BAC exam. Soon after that, Megan and Jacob moved into the house above his mother, and he began helping with their projects as their counterpart. He has participated in and facilitated many workshops and classes. He received 1st place in his age group in the "Write On!" 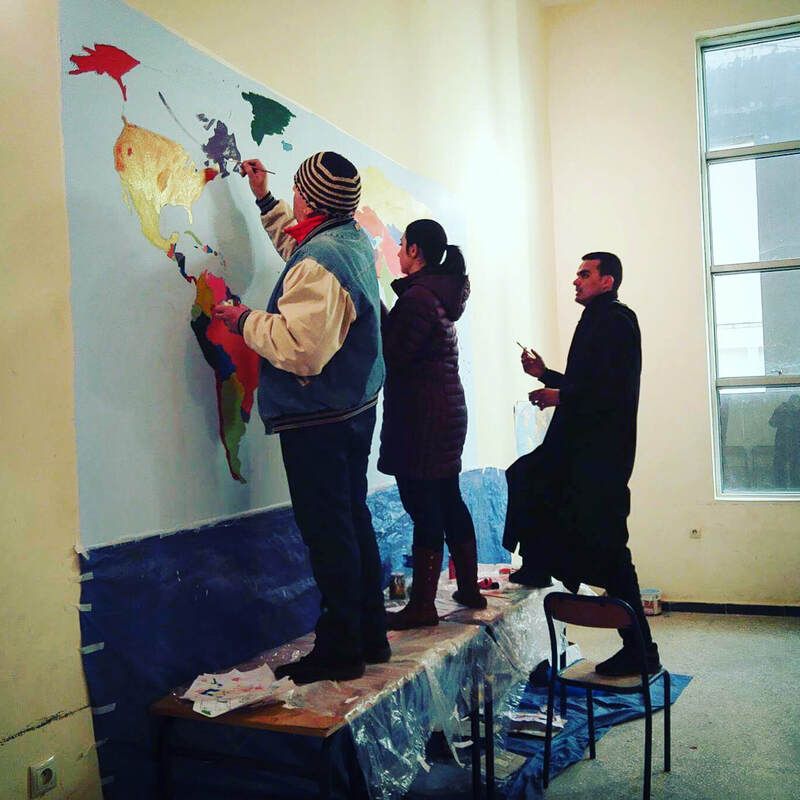 Creative Writing Competition in February 2018 and attended In-service Training in Marrakech to learn about life skills, volunteerism, and service learning. He loves trying all kinds of American foods and enjoys cultural exchange. His favorite restaurant is Burger King. Today, Ayoub is a third year English Linguistics student at the nearby university and is torn between pursuing a career in Language Teaching or Social Work. Following the example of the Peace Corps volunteers he has known, he hopes to become a volunteer with Corps Africa after he finishes his studies and maybe one day work as an LCF for Peace Corps trainees. أيوب طالب جامعي وجار ونظير وصديق للمتطوعين يعقوب وميغان. عندما كان أيوب أصغر ، كانت والدته تخبره بقصص متطوعي هيئة السلام الأمريكية الذين عرفتهم وعملت معهم. تحولت القصص التي استمع إليها إلى إعجاب باللغة الإنجليزية والثقافة الأمريكية. عندما كان أيوب في المدرسة الثانوية ، كان أحد مدرسي اللغة الإنجليزية مشرفاً سابقاً عن اللغة والثقافة بهيئة السلام ، وساعده متطوع سابق على إعداد دروس التقوية من أجل اجتياز امتحان المدرسة الثانوية. بعد ذلك بوقت قصير ، انتقلت ميغان وجاكوب إلى المنزل الكائن فوق بيت أمه ، وبدأ في المساعدة في مشاريعهم ،كنظير لهم. شارك في العديد من ورشات العمل والدروس وقام بتسهيلها. حصل على المركز الأول في مجموعته العمرية في "الكتابة! في " مسابقة الكتابة الإبداعية في فبراير 2018 وحضر "تدريبا أثناء الخدمة" في مراكش للتعرّف على المهارات الحياتية والعمل التطوعي وتعلم الخدمة. إنه يحب تجربة جميع أنواع الأطعمة الأمريكية ويستمتع بالتبدلات الثقافية. مطعمه المفضل هو برجر كينج. اليوم ، أيوب هو طالب لغويات اللغة الإنجليزية في السنة الثالثة بالجامعة ، وهو حائر بين متابعة مهنة في تدريس اللغة أو العمل الاجتماعي. وعلى مثال متطوعي هيئة السلام الذين يعرفهم ، يأمل في أن يصبح متطوعًا مع Corps Africa بعد أن ينهي دراسته ، وربما يعمل يومًا ما ك مشرف عن اللغة والثقافة لمتدربي هيئة السلام.أيوب طالب جامعي وجار ونظير وصديق للمتطوعين يعقوب وميغان. عندما كان أيوب أصغر ، كانت والدته تخبره بقصص متطوعي هيئة السلام الأمريكية الذين عرفتهم وعملت معهم. تحولت القصص التي استمع إليها إلى إعجاب باللغة الإنجليزية والثقافة الأمريكية. عندما كان أيوب في المدرسة الثانوية ، كان أحد مدرسي اللغة الإنجليزية مشرفاً سابقاً عن اللغة والثقافة بهيئة السلام ، وساعده متطوع سابق على إعداد دروس التقوية من أجل اجتياز امتحان المدرسة الثانوية. بعد ذلك بوقت قصير ، انتقلت ميغان وجاكوب إلى المنزل الكائن فوق بيت أمه ، وبدأ في المساعدة في مشاريعهم ،كنظير لهم. شارك في العديد من ورشات العمل والدروس وقام بتسهيلها. حصل على المركز الأول في مجموعته العمرية في "الكتابة! في " مسابقة الكتابة الإبداعية في فبراير 2018 وحضر "تدريبا أثناء الخدمة" في مراكش للتعرّف على المهارات الحياتية والعمل التطوعي وتعلم الخدمة. إنه يحب تجربة جميع أنواع الأطعمة الأمريكية ويستمتع بالتبدلات الثقافية. مطعمه المفضل هو برجر كينج. اليوم ، أيوب هو طالب لغويات اللغة الإنجليزية في السنة الثالثة بالجامعة ، وهو حائر بين متابعة مهنة في تدريس اللغة أو العمل الاجتماعي. وعلى مثال متطوعي هيئة السلام الذين يعرفهم ، يأمل في أن يصبح متطوعًا مع Corps Africa بعد أن ينهي دراسته ، وربما يعمل يومًا ما ك مشرف عن اللغة والثقافة لمتدربي هيئة السلام.